Inside a packed room at St. Basil’s Cultural Centre in Edmonton, Rachel Notley promised to fight for Albertans from her riding of Edmonton-Strathcona. Introduced by her son, Ethan, Notley touched on the community values that sustain her and spoke about the central Edmonton riding. She has represented Edmonton-Strathcona since 2008, the area home to Whyte Avenue, the Fringe Festival and tree-lined neighbourhoods near the North Saskatchewan River valley. Notley gave her vision for a dynamic, diverse, and outward-looking province. Notley talked about gains Albertans made in the last four years, including a 50 per cent reduction in child poverty, strong health care, and the fact that Alberta no longer has the lowest minimum wage in Canada. She promised to continue building support for Trans Mountain while pushing for the biggest diversification agenda since Peter Lougheed. Under Notley’s leadership, $12 billion of private investments are slated to build Made-in-Alberta upgrading. When Notley won in 2015, she reversed Conservative plans to slash education funding, hiring 4,000 teachers and support staff to meet the needs of growing classrooms. Notley’s government has funded 244 new or renovated schools. 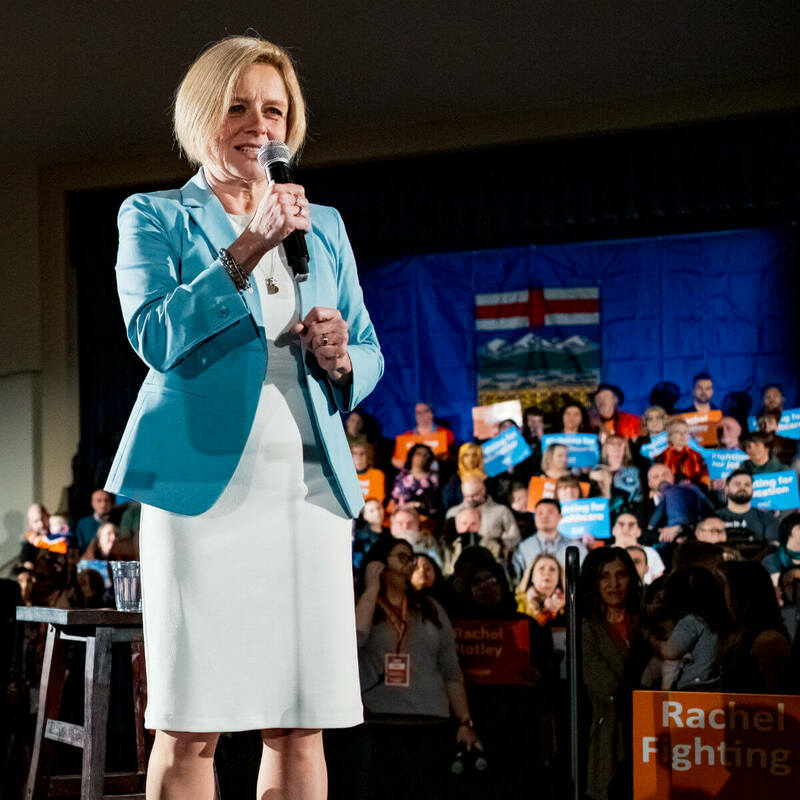 While Notley didn’t dwell on her opponent, she pointed to a clear choice in the coming election. Jason Kenney has been eager to freeze school funding, Notley said, while promising the most generous tax giveaways in Canadian history to Alberta’s most profitable corporations. Albertans deserve more than a shrug of the shoulders, she said, but a leader who will fight for everyone in Alberta.